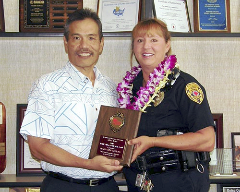 Chief Harry Kubojiri presents a plaque to Officer Denise Smith-Erickson, State of Hawaiʻi D.A.R.E. Officer of the Year. Officer Denise Smith-Erickson has earned the statewide distinction of State of Hawaiʻi D.A.R.E. Officer of the Year for 2013. Smith-Erickson, a 14-year veteran of the Hawaiʻi Police Department, is a Community Policing officer in the South Kohala District. Among her responsibilities is Drug Awareness Resistance Education for schoolchildren. Her D.A.R.E. presentations go beyond lecturing to include one-on-one interaction and individual counseling. Lieutenant Juergen Canda, who nominated Smith-Erickson for the honor, said her performance as a D.A.R.E. officer has been “resoundingly successful.” He noted that Smith-Erickson expanded D.A.R.E. services in West Hawaiʻi by adding the program to Waikoloa Intermediate School and and by enhancing the effectiveness of D.A.R.E. by speaking to parents to provide support and student counseling. Smith-Erickson’s past assignments included work on the Vice Section’s Airport Task Force. In nomination papers, Canda said her drug expertise and her “aggressive drug related interdiction” have contributed to the decline in crime in South Kohala. The award was announced at the 2014 State of Hawaiʻi Biennial D.A.R.E. Conference at the Ala Moana Hotel in Honolulu on February 27.